When fresh, ruby-red cherries appear in the market, you know summer is here. A member of the stone fruit family (along with peaches, plums and apricots), juicy cherries are divided into two main types: sour (tart) and sweet. Washington,California and Oregon are the largest U.S. producers of sweet cherries while Michigan and Wisconsin grow most of our sour cherries. Fresh sweet cherries are available May through August and sour cherries only from June through early July. Fresh sour cherries are seldom sold in supermarkets, so scout them out at farmers’ markets or roadside fruit stands. Whether eaten out of hand or baked into a pie or cobbler, be sure to enjoy succulent summer cherries. Select plump firm cherries with smooth shiny skins. Cherries with their stems still attached spoil less rapidly than those without stems. Look for fresh green, rather than dried out, stems. Since cherries don’t ripen further after picking, avoid any that are small, poorly colored or hard. Avoid any that are soft or sticky with brown spots or broken skins (sour cherries are slightly soft when ripe). Refrigerate unwashed cherries in a bowl loosely covered with plastic wrap for up to 3 days. To freeze fresh cherries, wash and pat dry. Pit them over the container they will be stored in to catch any juices. Freeze in airtight container for up to 10 months. For best results, freeze cherries soon after purchasing as their red color begins to fade after picking. Sprinkle a small amount of granulated sugar over sour cherries before freezing to preserve their red color. Sweet Cherries: Larger in size and with a firmer texture than sour cherries, they are round, oblong or heart-shaped with light- to dark-red skins. The juicy flesh has a rich sweet flavor so they can be eaten out of hand or cooked. Bing is the most common U.S. variety of sweet dark-red cherries. Some sweet cherry varieties are golden- to white-skinned, such as Rainier and Royal Ann. Maraschino cherries are usually produced from Royal Ann cherries. Sour Cherries: Smaller in size and with a softer texture than sweet cherries, they are round with medium- to dark-red skins. The juicy flesh has a tart sour flavor so these cherries must be sweetened and cooked before eating. 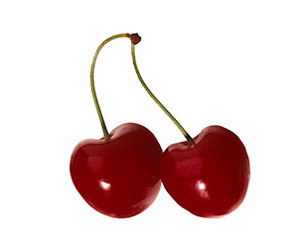 Morello and Montmorency are the two most popular sour cherry varieties. Traditionally baked into pies, sour cherries are used in canned pie fillings and are also called "pie cherries." Rinse cherries under cold water just before using. Remove and discard stems. Remove pits with a cherry pitter or paring knife, working over a bowl to collect the juices. To remove the pits with a paring knife, make a slit from top to bottom around circumference of each cherry. Pull it apart and pop out pit with tip of knife. This method results in cherries being both pitted and halved. Frozen cherries are best used for cooking and baking. Do not thaw them before using. Use in simple, old-fashioned fruit desserts, such as pies, cobbler, crisps and crumbles. Preserve fresh summer cherries to enjoy all year round by turning them into homemade jam or jelly. Add pitted sweet cherries to the blender while whipping up smoothies and shakes. Cherries pair well with almonds because cherry pits, which should not be eaten, have a natural almond flavor. Chocolate and cherry is a classic flavor combination, as in chocolate-covered cherries and Black Forest torte. Toss halved sweet cherries into your favorite fruit salad. Stir pitted, chopped sweet cherries into yogurt or BREAKSTONE’S Cottage Cheese. Substitute chopped cherries for other fruits in quick bread or muffin batter. Garnish summer drinks with pitted, frozen sweet cherries in place of ice cubes.